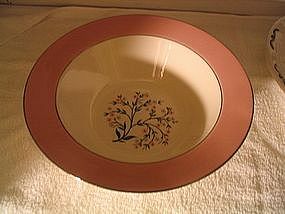 Vegetable bowl by Homer Laughlin Cavalier Eggshell Springtime in the pink design (CV32). This bowl is the larger size of 9 5/8 in width. No chips, cracks, breaks, rough rims or crazing. VERY MINOR loss to the platinum trim and little sign of use which is most unusual. Additional photos or info by email. One dinner plate is available for purchase. I need your zip code to calculate the postage.